Performance attribution is the process of decomposing a portfolio's return into subcomponents that are each the result of the decisions that went into the construction of that portfolio. 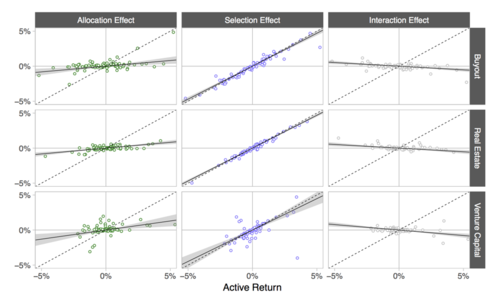 In the latest paper from Burgiss Applied Research, the team examines Brinson-style attribution, which decomposes a portfolio's active returns into allocation and selection effects, and supplies a methodology to carry out this exercise for private capital. In addition to describing the attribution methodology, the working paper also provides two detailed case studies that illustrate the results of attribution applied to two concrete portfolios. Several aspects of their performance are explained naturally via this paper’s attribution methodology; without it such an analysis is non- trivial. Get a copy of the Executive Summary of this report here. What Happens to Cash Flows During a Crisis?